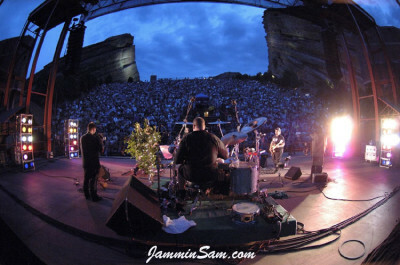 Pictures sent in (March 2006) by Scott Schroeder of Lakewood, Colorado of his Pearl Masterworks drum set at the Red Rocks. Awesome pictures Scott! Hi Guys, I thought you might like to see where I have been putting your wrap. I play for the Denver based band The Trampolines. The last year has been pretty remarkable for us. Through all of the craziness there has been one constant– how killer my drums look on stage. 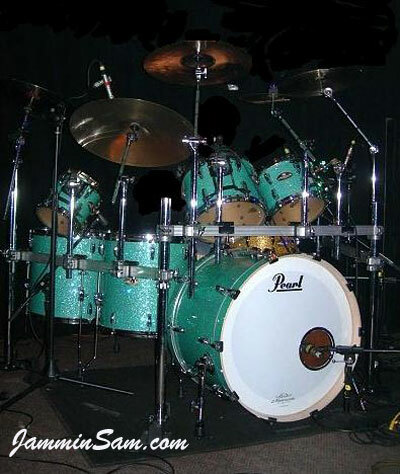 These are my Pearl Masterworks– pretty much the Ferrari of drum sets. As we all know, while lacquers can do a pretty decent sparkle finish, it just isn’t the same as the reflection given off by the glass glitters. As well, with as many shows as I played last year, I am SO pleased with the durability. I was actually thinking of buying a disposable kit like an Export, knowing the abuse it would be facing. I am pleased with how it all worked out– the drums still look and sound brand new. Using you folks have also allowed me to add additional drums and make everything match easily, without the cost/time/money/hassle involved matching a custom lacquer. I have 8 Octobans on the way– you will be getting another call soon. The attached “money shot” was our sell out show at the world famous Red Rocks Amphitheater– just us and 9000 of our closest friends. My drums looked amazing… THANKS SO MUCH!